LUCKNOW: Talks to resolve the contentious Ram Janmabhoomi-Babri Masjid issue, pending in the Supreme Court, have gained momentum at different levels. While Shia Waqf Board chairman Waseem Rizvi met chief of Akhil Bharatiya Akhara Parishad, Mahant Narendra Giri, on Monday, Sri Sri Ravishankar of Art of Living is expected to visit Ayodhya on Thursday to hold talks on the issue. Meanwhile, Uttar Pradesh chief minister Yogi Adityanath stressed that a peaceful solution to the Ram Temple issue should be found through a dialogue among the stakeholders. Offering his government’s support to such an exercise, the chief minister said a dialogue could be the best way to find an amicable solution to the lingering issue. “It will help maintain amity in the state,” he added. “If someone takes the lead and initiates a process in this direction, I will welcome the move,” he told media persons at Raipur airport. After his meeting with the Shia Waqf Board chairman, Mahant Giri stressed on the need to take all parties involved in the case, including the Sunni Waqf Board, into confidence to find a solution. The Mahant expressed satisfaction over the talks with Rizvi claiming there was an agreement on broader points over the issue. “The Akhara Parishad will hold talks with the Sunni Waqf Board members also and all other stakeholders for the peaceful settlement of the dispute. People representing the Sunni community are part of our plans for finding an out-of-court settlement to the Ayodhya issue,” he said. Mahant Giri, however, did not give details of his plans for holding talks with representatives of the Sunni community. Incidentally, this is the second round of discussion that Mahant Giri has had with Rizvi on the issue. 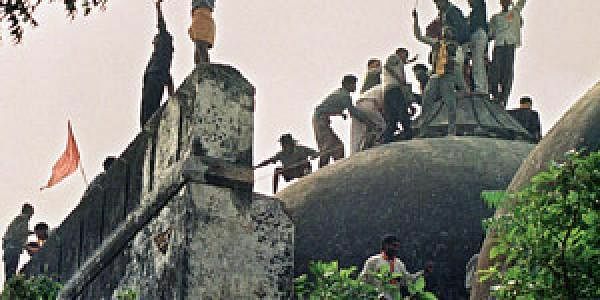 During the meeting on Sunday, Rizvi had sought construction of a Babri Masjid grand mosque at Ayodhya away from the Ram Janmabhoomi or anywhere in Faizabad district in a Muslim-dominated area. Mahant Giri had objections to the proposal and invited Rizvi to Allahabad for a second round of parleys. Mahant Giri is believed to have conveyed to Rizvi that there were enough mosques in Ayodhya and hence there no need to construct a new one. “Shia Waqf Board has agreed to our terms that there were enough mosques in Ayodhya and there was no need to build a new one. Also, no mosque named ‘Babri Masjid’ will be built anywhere in the country as it may lead to animosity among the two communities,” Mahant Giri said, adding that the mosque could come up in any Muslim-dominated area of the ‘country’. However, one of the main litigants Iqbal Ansari (son of Hashim Ansari, the first Muslim to have gone to court in the early 1960s over the issue), who is representing his father in the case, opposed Rizvi’s move saying he was capable of talking to Hindu seers and stakeholders in Ayodhya to find a solution. Ansari chose to oppose Rizvi’s offer saying it won’t be acceptable to Mulsims of Ayodhya and the country. Meanwhile, Sri Sri Ravishankar, Founder of Art of Living, is scheduled to visit the temple town on November 16 to hold meetings with leaders of both the communities separately as part of his efforts to find a peaceful solution to the long-standing dispute. Ravishankar had recently admitted that he had been mediating among parties involved to find an out-of-court settlement to resolve the dispute.